2015 Citroen C4 Picasso 1.2 Puretech 130 S&S review | What Car? We have always been enthusiastic about the Citroen C4 Picasso, and happy to recommend it, thanks to virtues such as space, versatility and low running costs. If your focus is on running costs, the default option has been a diesel, which traditionally offers the best fuel consumption and emissions. However, for those that prefer petrols, Citroen has just launched its 1.2-litre turbocharged three-cylinder Puretech engine. The 129bhp unit gives better performance than the larger-capacity petrol engine it has replaced, while also being cleaner and cheaper to run. It is, however, only available on entry-level VTR and VTR Plus trims. 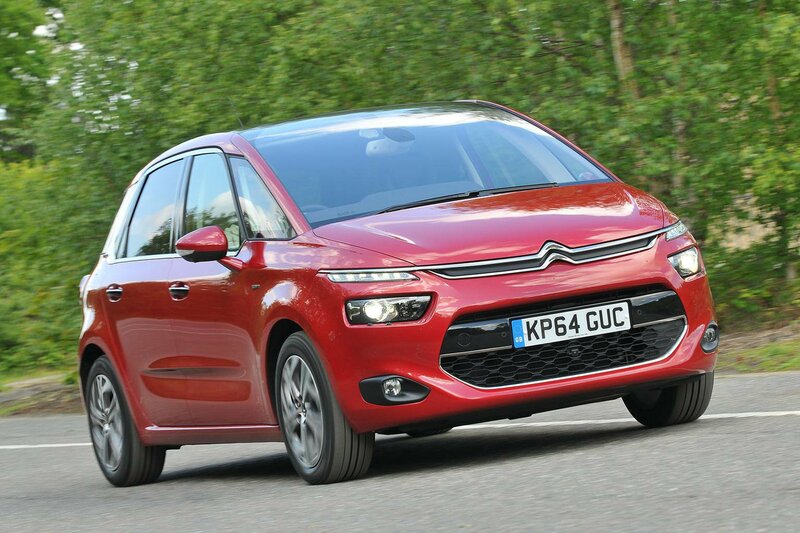 The C4 Picasso’s rivals include mid-sized MPVs such as the Volkswagen Golf SV 1.4 TSI 110 and Ford C-Max 125 Ecoboost. What’s the 2015 Citroen C4 Picasso 1.2 Puretech 130 like to drive? Four-cylinder engines, like the one found in the Golf SV, tend to be smoother than the buzzier three-cylinder units used in the C4 Picasso and the Ford C-Max. However, the Citroen's Puretech 130 sounds relatively hushed. Sure, there’s still a rasp under hard acceleration, but in general it's pretty refined. Like many small-capacity petrol engines, the Puretech 130 uses a turbocharger to boost performance. In the Citroen this gives a noticeably stepped power delivery. It’s sluggish at low revs while you wait for the turbo to get going, and when it does – at around 1500rpm – the Picasso takes off quite abruptly. From then on the power delivery is more progressive, pulling evenly and feeling rather peppier than the 0-62mph time of 10.8sec would suggest. It certainly feels more sprightly away from a set of traffic lights than a C-Max. This engine comes with a six-speed manual gearbox – there's no automatic option – and the ratios are well spaced to make best use of the power delivery. It's quiet at a cruise on the motorway, and, with tyre noise fairly subdued, it's only wind noise that'll bother you on a long journey. Predictable, well-weighted steering makes the C4 Picasso enjoyable to drive down winding country lanes, but equally it requires pleasingly little effort to steer in town. Body control is also good for such a tall car; there’s modest lean in bends but it never feels sloppy to drive. Over most surfaces the ride is soft and compliant. That said, sharp ruts transfer quite a thump into the cabin and the C4 Picasso’s soft suspension does cause it to bob up and down over a series of undulations. What’s the 2015 Citroen C4 Picasso 1.2 Puretech 130 like inside? With its typical MPV-style high-up seating position and a large frontal glass area, it’s easy to get a clear view of the road ahead in the C4 Picasso. One thing you can’t see, though, is the end of the steeply sloping bonnet. The seats give plenty of support and, along with the steering wheel, have enough adjustment to accommodate most shapes and sizes. While the Golf SV is the benchmark for perceived cabin quality, the Citroen isn’t far behind. There are plenty of soft-touch materials and attractively textured surfaces on the upper dashboard. It’s much less austere than the Golf SV, though, with a pleasing splash of Gallic flair evident in its design. If you’re tall and sitting in the rear, and behind someone of a similar height up front, you may find the rear leg room tight, but otherwise there’s enough space available to seat three averagely sized people with relative ease. Each person will find they have individually reclining seatbacks, while all three rear seats can be slid forward to increase boot space. In this mode you have a colossal 630 litres of luggage space – bigger than either the Ford or the VW. Citroen says this Euro 6-compliant engine reduces average fuel consumption by as much as 18% (when compared to the outgoing 1.6-litre petrol), which translates into a combined economy figure of 56.5mpg. With CO2 emissions also down to 115g/km, it's now just as efficient as the competition. One note of caution, though: when we’ve carried out real-world True MPG fuel economy tests on this engine in other models, it’s been some way off the official figures, so it's a fair bet that a diesel version, such as the Blue HDi 120, will still be cheaper to run day to day. We haven't yet driven the facelifted Ford C-Max in the UK so we don't know if the updates have improved its performance in the class, and we know that a Golf SV holds its value better and seats four adults more comfortably than the C4 Picasso. Even so, the Citroen is one of our favourites in this class. It's great value, is good to drive and has a versatile cabin. It's a great all-rounder and thoroughly recommendable. Should you buy this 1.2 version? Well, the diesel still edges it thanks to its better real-world economy, but if you spend most of your time around town and don’t do enough miles to justify the higher purchase price of the diesel models, then this new Puretech 130 engine makes a lot of sense.